The past month has brought us titles galore -- the Stanley Cup, the NBA Championship, the Premiership, and a slew of springtime NCAA and high school champs. So who's the best of the best, right here, right now? We've got the answer -- but we reserve the right to change our mind in a month or two. The best team in the NL, with Scott Rolen, Albert Pujols and Jim Edmonds simply pounding the horsehide. The Cards are leading the toughest division in the league by five games, and have the most potent offense in the NL. 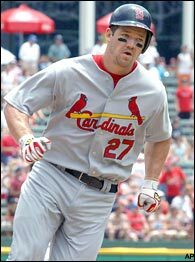 The Cards' pitching has been very good; and, with Woody Williams and Matt Morris performing below par, can only improve..
Scott Rolen's played a big part in the Cardinals' success this season. Among the team's stars: freshman third baseman Matt Dominguez, who drove in 64 runs; senior pitcher/center fielder Jason Dominguez (Matt's older brother, bound for Pepperdine), who went 13-0 with a 1.38 regular-season ERA and drove in 34 runs; and second baseman Willie Cabrera, who batted .545 with 11 home runs and a state-record 72 hits in the season. Super Bowl champs. Fifteen straight wins . . . and counting? The Bruins won their second straight NCAA title on May 31, winning the Women's College World Series by beating Cal in the final, 3-1. UCLA, led by first-team All-Americans Keira Goerl, a pitcher, and Caitlin Benyi, a sophomore second baseman, went 47-9. The Bruins had two All-America players on their team: soph third baseman Andrea Duran and senior center fielder Stepanie Ramos. The Bruins will have the best infield in the nation next season -- besides Benyi and Duran, All America honorable mention Jodie Legaspi, a shortstop, is only a freshman. Benyi led the team in batting (.379), HR (24) and RBI (43). Goerl finished the season with a 31-7 record and a 1.02 ERA. Arsenal's Thierry Henry just might be the best soccer player in the world. After starting the season with a 15-16 record, the Titans caught fire, and culminated their season Sunday by sweeping heavily-favored Texas to win the College World Series title. They went 32-6 after enlisting the services of their MVP (Most Valuable Professor), sports psychologist Ken Ravizza. The Titans made it to the top with the best hitter in college baseball, first-team All-American catcher Kurt Suzuki. Suzuki, a junior who hit .413 with 16 HR and 87 RBI this season, was a second-round draft pick by the A's. Second-team All-American Jason Windsor, the World Series Most Outstanding Player, went 13-4 with a 1.72 ERA and was also drafted by the A's, in the third round. The Lightning won the Stanley Cup after finishing the regular season with the NHL's second-highest point total (106, behind Detroit's 109). They opened the playoffs in spectacular fashion, taking out the Islanders in five games in the first round and sweeping the Canadiens in Round 2. Martin St. Louis, the league MVP, led the NHL in points and finished tied for fourth in goals scored with 38. He also tied for the league lead in assists, with 56 -- one ahead of teammate Cory Stillman (55) and three ahead of Brad Richards. St. Louis, Richards and Stillman were the NHL's top three scorers after Dec. 18. Richards won the Conn Smythe trophy as the playoff MVP. John Tortorella was voted the NHL's top coach. Goaltender Nikolai Khabibulin had a great playoff run, with five shutouts and a 1.71 goals-against average. The Yankees are the best team in MLB again this year, both in real terms and in theory. Their record is the best in baseball by three games (the Cards are second), and they're deservedly No. 1 in ESPN.com's power rankings. Derek Jeter is on a tear -- his batting average is up to .257 after flirting with the Mendoza line just a month or so ago. Alex Rodriguez is tied for second in the AL in home runs, with 19. Jorge Posada is having an excellent year (while everyone's talking about I-Rod -- Ivan Rodriguez, in Detroit -- Posada has been his equal offensively). The Bombers don't lead the AL in runs scored (they're fourth) or pitching (sixth), but they've had a tough schedule and are likely to be on top again at the end of the regular season. You know this story. With no superstars and against long odds (12-1 at the start of the season) they devastated L.A. for the NBA title -- and almost literally destroyed the Lakers, a team that tumbled as quickly as a house of cards.